As I will be spending Valentines day as a single lady, I am going to treat myself and splurge on one of the things I probably own most of, perfume! I will be spending the day with my best friend Carla before we have a early start heading to Dublin on the Saturday morning for a few days. This smells absolutely amazing and I have lusted after it for so long. It has notes of ginger, tiger orchid, tea rose and cedarwood so it is a fruity, floral fragrance. I would say it is a quite grown up scent without being too sickly and sweet. The smell lingers a while and I love the bottle and packaging, simple yet effective. £28.75 a bottle which is a saving of £5.25 on the RRP. 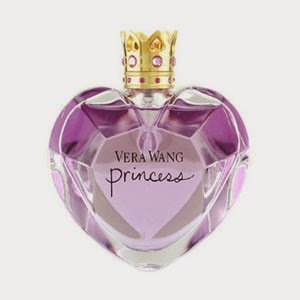 One of my faves, Very Wang princess is a fruity aroma with vanilla. The bottle is just adorable. Glass, shaped in a heart with a crown jewel lid that can double as a ring. This would make the perfect valentines day gift! £28.99 a bottle with a saving of over £5. This is a fragrance I have purchased many times and love. Its quite a youthful fragrance and as it is Lacoste I'm sure it wouldn't suit everyone's tastes. However, having said that it is sweet and floral with notes of orange, coriander, cardamom, peach, blood orange, jasmine, violet, musk and vanilla and I am quite a fan. £20.95 with a saving of £5.05 on the RRP. If you were to ask my all time favourite perfume in the whole wide world I would say Dolly Girl each and every time. I first got this when I was 13 and even at nearly 25 I still always have a bottle of the stuff. It smells amazing! It has fruity apple and melon notes with floral notes such as jasmine, lily of the valley and rose. £19.99 with a saving of £4 on the RRP. This is a fragrance that my friends have owned and I have lusted after for such a long time. As it is a Eau De Parfum on first 'sniff' it is quite strong smelling but lasts a long time and smells more subtle. Allegedly it contains molecules inside that stimulate part of the brain that is responsible for lust and attraction hence the name. It is a spicy-floral scent and resembles a heart shaped diamond pierced with an arrow. £30.99 with a saving of £5 on the retail price. Ladies, which is your favourite? What will you be asking your man for for Valentines day? Or like me, any you will be treating yourself to?